Niniwa-i-te-rangi (often known as Niniwa Heremaia), a Ngāti Kahungunu woman of mana, was born in Wairarapa in 1854. Through her battles in the Native Land Court, her abilities as a speaker, and her knowledge of whakapapa and tradition, she qualified as a leader of Wairarapa Māori. She was involved in hosting the Kotahitanga Parliament when it met at Pāpāwai in 1897 and 1898. Later she took an editorial role in setting up the Maori-language newspapers Te Puke ki Hikurangi and Te Tiupiri. During the 1890s her stature as a leader increased, and in 1898 she was the only woman who gave evidence to Parliament’s Native Affairs Committee inquiry into Māori land legislation. In 1904 Niniwa sponsored the production of the Maori Record, an English-language newspaper devoted to the advancement of the Māori people. She died at Greytown in 1929. 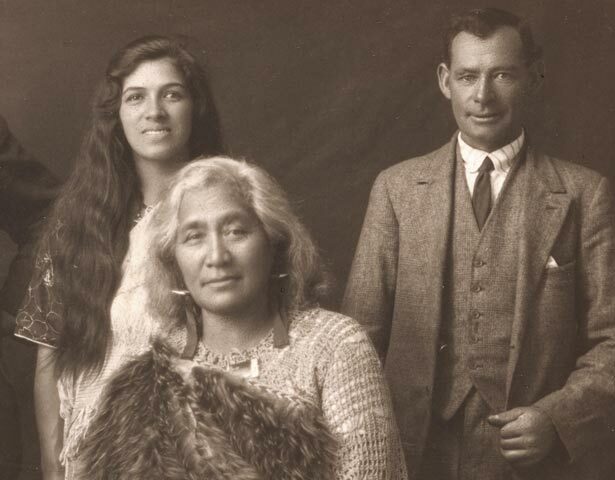 He wahine whai mana a Niniwa-i-te-rangi nō te iwi o Ngāti Kahungunu. I whānau mai ia ki Te Wairarapa i te tau 1854. Nā runga i ana tohenga i te Kōti Whenua Māori, tōna reo tatakī, tōna matatau ki ngā whakapapa me ngā kōrero o tōna rohe, ka puea a ia hei kaiārahi mō ngā Māori o Te Wairarapa. Ko ia tērā i āwhina kia tū te Pāremata o te Kotahitanga ki Pāpāwai i ngā tau o 1897 me 1898. Whāia, ka noho a ia hei ētita mō ngā nūpepa reo Māori, Te Puke ki Hikurangi me Te Tiupiri. I te tekau tau atu i 1890 ka kake whakarunga tōna mana, ā, i te tau 1898 ko ia anake te wahine ka tāpae kōrero ki mua i te Komiti o te Pāremata mō ngā Take Māori, i rangahau rā i ngā ture whenua Māori. I te tau 1904 nā Niniwa i tautoko ā-pūtea te Maori Record, he nūpepa reo Pākehā e whakatairanga ana i te iwi Māori. Ka mate ia ki Hūpēnui i te tau 1929. We have 12 biographies, related to Niniwa Heremaia.